I still remember my first journal–a hot pink binder with my name written in calligraphy, given to me by my dad, who always taught me that I should record down my thoughts. I was six. I’ve been keeping a journal ever since. Through the years, I’ve gone through journal phases–times when I wrote every day, times when I went several months without writing, times when I recorded more ideas, times when I recorded more events, journals where I focused on describing people, journals where I focused on describing myself…long story a little bit longer, I am not new at all when it comes to journal writing. So why did I choose to do it at as a Change It Up Challenge? Well, mostly out of guilt. I was super good on my mission to write nearly every day and include a lot of details, but since coming home, I’ve written sparingly. When I hit the two-month mark of not writing, I decided that something had to be done. Borders going bankrupt came at a good time for me, then. Last Friday, Matt and I spent a couple hours browsing the forlorn-looking bookshelves, trying to decide what was worth salvaging from the picked-over masses. 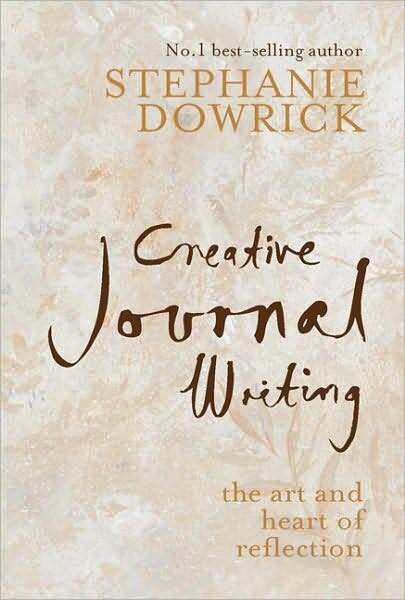 I had almost convinced myself that I had hit a reasonable price limit when I ran across a book by Stephanie Dowrick called Creative Journal Writing. I promptly placed it on the top of my armload and proceeded to the checkout (well, after browsing all the cooking magazines, which were 40% off). It was the first book to be eaten up when I got home. Just kidding. The truth of the matter is that this book has taken the coveted top spot on my Leaning Tower of Books Stack next to my bed (side note about this Leaning Tower–at the beginning of the school year, there was maybe one or two books there. It just goes to show you that even as a poor college student, there’s always enough money for books. At least in my world I convince myself that there is). Babbling aside, I start reading this book and the guilt intensifies–I’ve let an entire TWO MONTHS of my life go undocumented. I am scum. So to force myself back into the habit, I started doing a prompt-a-day in my journal. Some entries have been more insightful than others, and some have just been to fill a page. But something really curious happened to me this week in the process–all this junk that I’ve been ruminating about every hour, every day for months now has all of the sudden decided to just simmer quietly on the back burner of my mind instead of boiling all over the place on the big front burner (another side note–I hate how there’s only one big burner on our stove. On our literal stove, not on my mind stove, although I guess there’s only one big burner there too). Before, when I had journal-writing as more of a habit, I didn’t seem to have as much on my mind, or at the very least, I didn’t dwell on the same things over and over and over again. Since stopping, it was like a drain getting clogged with handfuls of hair and soap scum and having no Drain-O around. I now know that my journal is my Drain-O. And it’s felt pretty great to un-clog. Change It Up Successful: Very much so. I’m now motivated once again to start recording things down. Thank you Borders! !